Tofu is also known as Soy Bean Curd made by coagulating/curdling the soya milk. Resembles like Paneer (cottage cheese). It is rich in nutrients such as protein and calcium; it's a versatile ingredient in cooking; it is bland in taste and it absorbs the flavour and taste from the gravy or spices added. Good for Low fat and low cholesterol diet. This Bhurji is a easy to make; tastes nice with Rice and Rasam. Can be used as a filling for wraps like chapathis or tortillas. Healthy tasty Bhurji, with the addition of capsicum adds volume, texture and crunchiness to this dish. 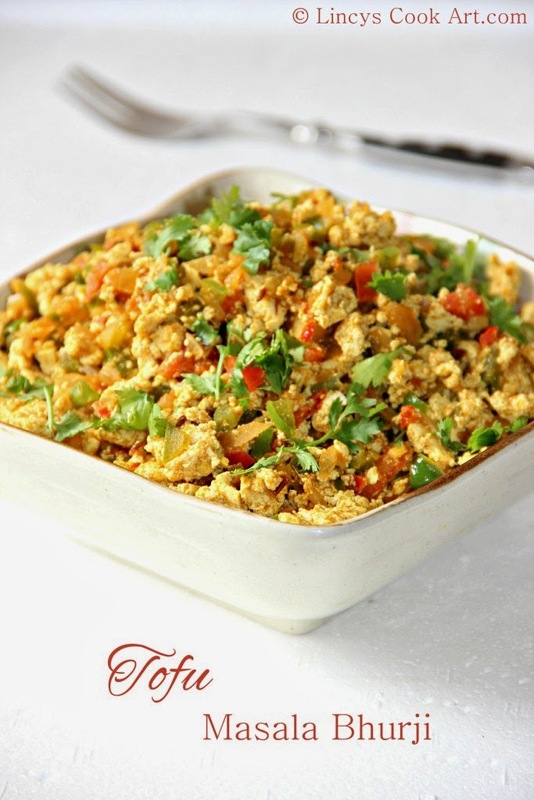 Try this with Rice and Rasam combination; you are going to love this Tofu Bhurji. Same recipe can be followed to make Paneer or Egg Bhurji. Drain Tofu from water and crumble as small pieces using hand. Heat oil in a pan and add cumin seeds and curry leaves, when the aroma arises add the onion, ginger and green chillies. Cook for thirty seconds on medium flame. Add the masala powders turmeric, chilli powder with coriander powder and saute for fifteen seconds. If you feel the masala will burn add a tablespoon of water. Add tomatoes and salt; cook in high flame for a minute or two to dry out the water that oozes from tomatoes. Add the capsicum and stir well; immediately add the crumpled tofu; mix well and cook on medium flame. Add salt if needed and cook till the masala coats well; As the water dies out and comes out with scrambled egg consistency. would love to have this with bread! Who will say no to this irresistible bhurji,, definitely not me..
Another fabulous dish. Its on and this time, I will make sure I can the ingredients ready. Healthy and delicious tofu masala!! omg such an inviting masala bhurji and picture perfect looks fantastic !! bhurji looks so good ..really tempting .